Cook rice as directed. Drain if necessary, stand rice 5 minutes, stir in water, citric acid, sugar, and salt then cool. 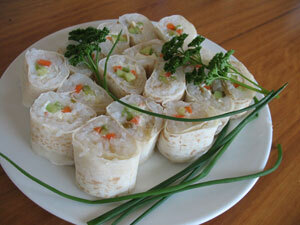 Place one sheet of Mountain Bread on a bamboo sushi mat or plastic sheet with the wide side across. Dip fingers in water and spread the cooled rice over bread in an even layer about 1 cm thick, leaving a 4cm gap on the short side furthest from you. Press rice firmly in place, then use finger to make long indentation across rice edge closest to you. Place prepared vegetables and mayonnaise in the indentation. Use the empty edge of the mat to help start rolling the sushi. Press the mat firmly as you roll. Carefully remove the roll from the mat and using a sharp wet knife cut the roll into eight pieces. Makes 24 sushi rolls.